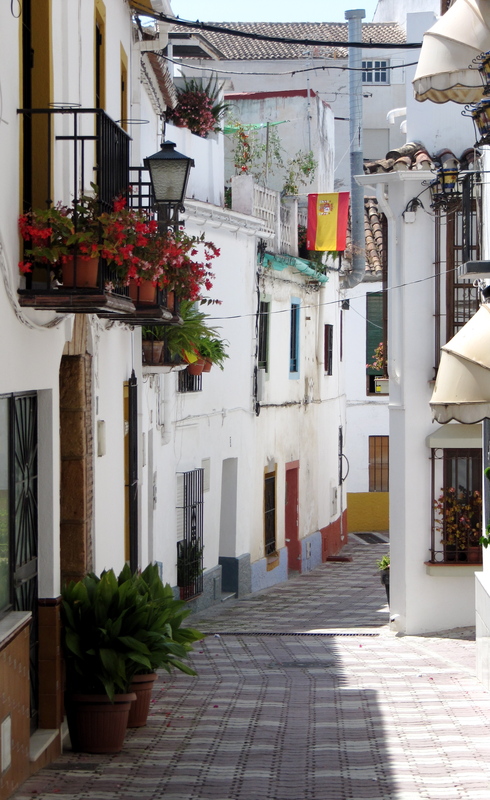 My first trip to Andalucia impressed me enough to plan a second trip. Here are my notes on the most outstanding places to visit on the coast. First, a note on the language: They don’t really speak Spanish here, only Andaluz! Your Spanish phrasebook will only get you so far. Andaluz quite similar to the Carribean Spanish as they sometimes don’t pronounce their “S” or the “D”, “T” and “R” on the last syllable of a word.Therefore if something costs €2.72 -“Dos, sententa y dos” – sounds something like “Dosentaydo” which makes it a bit tricky to get by, not only for the international traveller but for the folk that come down from Madrid. It was a bit of a guessing game for me. “No one would want anyone to learn Spanish down here unless you want them to sound like a tomato” I was told by an expat in Andalucia who is often laughed at for speaking like a hick. I think they sound great. Some notable places in Andalucia include Almerimar for it’s rustic port-side atmosphere, impressive fortress castle (in nearby Almeria) and cheap drinks with tapas; Marbella and Puerto Banus are the glamour capitals of the coast and Granada for its historical relics as the Moor’s last foothold in Europe. I visited some friends in Almeria and was lucky enough to have them cook me a Paella Al Andaluz, which I feel is much better than the dry Valencian variety that is well known around the world. 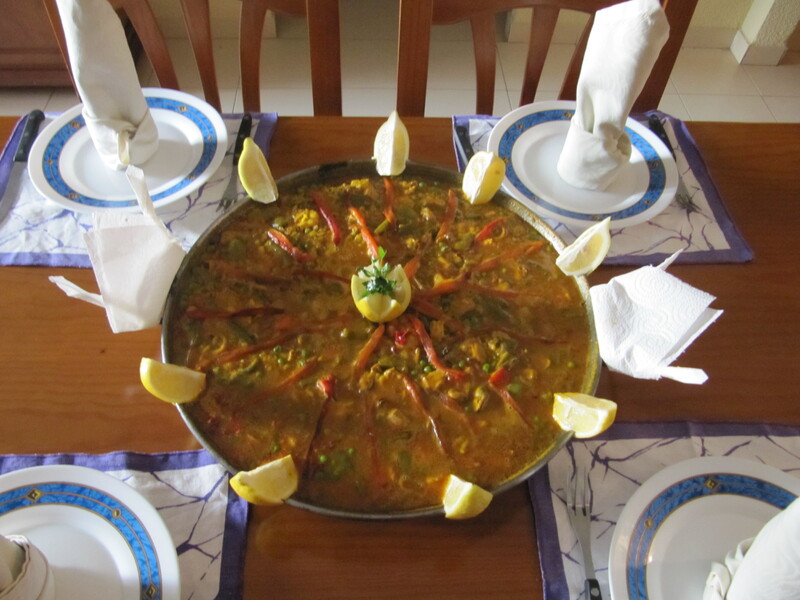 Don’t leave Southern Spain until you’ve tried their local paella – it’s usually all seafood, no chicken. Fresh seafood makes a big difference, and our friend M caught most of it himself. I stuck to pastas and salads after a few days of eating a lot of greasy tapas, which were tasty but full of calories. Chicken and chips are also big news in Granada and Andalucia. For some reason most of the seafood I had in restaurants – even nice ones – was frozen, not fresh. I have no idea why as the whole area is full of fishing boats. Let’s take a look at 3 Andalucian towns that are not as famous as Grenada, Seville or Cordoba but offer plenty to see and do for travellers. These two places are very close – within a few minutes of each other, so I will stick them together. I prefer Puerto Banus, it seems more sophisticated and not as trashy as Marbella, which isn’t my favourite place – but I do love the Old City of Marbella. It’s not the easiest place to get around without a car unless you are staying in Marbella city, where the beach, shops and attractions are within walking distance, the taxi service is good though, and you never have to wait long at the taxi stands. Even the golf resorts out of town can call taxis at any time, but if you are staying at one of these places be prepared to wait around a bit. At any of the restaurants along the beach at Marbella – they are usually pretty good. For high quality Andalucian cooking, head to El Balcon De La Virgen in Marbella’s Old City is in a 16th Century building covered in Bougainvillea. It serves high quality pasta, beautiful fresh grilled sole and several types of Paella. The Ancient Roman Villas on the Rio Verde (get a taxi, they’re right between Marbella and Puerto Banus) they are closed on Mondays. The Puerto Banus port with it’s 10 million dollar Yachts are lovely and it’s a nice walk. 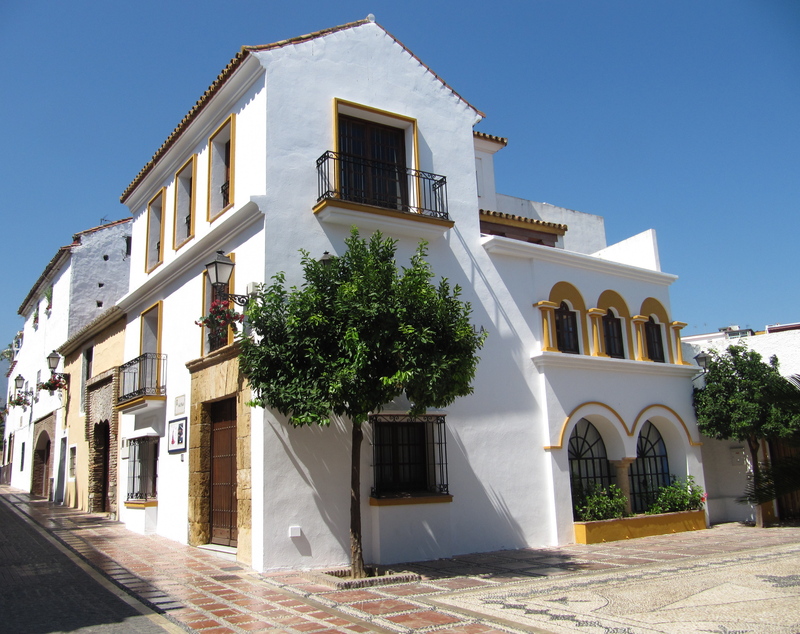 A trip to Marbella’s Old City in the town centre is also recommended – lovely old churches, homes, shops, restaurants and a dilapidated old fort can be found squished into a tiny area about 6 minutes walk from the beach. To bask in the sun head to the famous Marbella beach with all the famous folk – although it’s quite a drab – as were most of the beaches I saw to be honest – and Marbella was a crowded beach full of almost naked people. Hideous naked people in varying shades of fire engine red or a shrivelled orange. It’s definitely an experience. There’s also millions of golf courses on the Costa Del Sol.The average price of a game is about €50 but some course charge upwards of €250. La Quinta Golf course and Spa is a 5 star resort just 5 minutes from Marbella.I stayed at the Barcelo Marbella near Puerto Banus and many other hotels around the area offer special rates for the Guadalmina Golf Club. I don’t even play golf, by the way but I like the lovely spacious green area and the spas. Although luxurious and comfortable with pleasant restaurants, the golf clubs aren’t exactly hotels – there is often no mini bar or room service – but all the other comforts of a first class hotel are there. The beautiful Guadalmina Golf Club accommodation is very reasonable, even in high season. If you are looking to hit one of Spain’s hippest nightclubs, you’ve come to the right place. Pangea bar/nightclub is a stunningly beautiful outdoor bar and club with comfy, arab-style cushion lounges and a billion dollar view. Great drinks, they always get it right with the music – there is nothing like dancing under the stars. Exclusive and elegant but not snotty and there is less sleaze here than in the rest of Marbella. Bookings are essential. El Corte Ingles is a department store with outlets all over Spain. It’s a great place to shop for Spanish and international designers – they have amazing sales – I got some amazing silk dresses from Adolfo Dominguez that were 60% off, which is just spiffing! There are so many, many hotels around this area, from 2 star to 5+ stars. If you have some cash to spend there are the fancy golf resorts with hotels (see above) and there are the cute tiny hotels like Hotel El Castillo which I looked at – it’s cheap, especially considering the location. Although I’ve not stayed there I’ve seen some good reviews and intend to try it next time. This is a pretty little port near Almeria city- it’s small, clean and great fun. Almerimar is a small town with I surprisingly good selection of places to eat – in the main square there is MacGowan’s Irish pub with its outstanding curries, fish and chips and burritos or Restuarante Gourmet and El Arroz for fine Spanish dining. Away from the square is the fabulous Hong Kong restaurant which is so cheap and it’s just great Chinese.I don’t know why it’s such a big deal here but you can get Pollo Asador (roast chicken, served with chips and usually a salad) almost anywhere in Spain but the Restaurante Asador Almerimar (C/ Mar de Alboran) is famous for its chicken and chips. The menu del dia (lunch course) is only €9 for 3 courses and a drink. The servings are huge and it comes with a salad to share. Chicken and chips. What’s not to like? There is a nice golf course. No cinema, theatre or otherwise. The nearest place to shop is a few kilometres away in El Ejido (another Corte Ingles) and there are a few Roman ruins around there – one of them on a roundabout. Almerimar has a nightclub strip that can be very fun and lively in Summer. A wonderful, historical Moroccan style bath/spa called Alhammam Almeraya is definitely worth a visit in Almeria which is 30 minutes away. Almeria has a fortress castle (Alcazaba) which is beautiful, free to visit and has some kind of souq/bazaar on Saturday nights.There is a lot of excavation work being done on it at the moment. There aren’t many hotels but Hotel Almerimar is the big resort in town. I haven’t stayed but it looks quite luxurious. This website is very useful if you are looking for an apartment/villa to rent. Many of them have access to pools and there is a range of prices.